If you take part in motorsport driving, or ride a motorcycle (especially), I would recommend that you do not take your helmet for granted, under any circumstances. This is because you may regret it afterwards. You see, you never know when the unexpected may take place. If you aren't really buying what I am trying to say here, I suggest that you take a look at the picture involving the helmet previously worn by a Spanish F1 test driver, Maria de Villota. If you aren't quite aware or can't recall, Maria de Villota came across a horrifying incident while testing a Marussia Formula 1 racecar nearly a year ago. As for the cause of the incident, it has yet to be clarified. All that we know is that she crashed the F1 car she was piloting at that time due to some unexplained acceleration. According to eyewitnesses, though, the car had been misfiring. Had it been true, I wonder why the engineers weren't really concerned about it. Anyway, it was really a misfortune as Maria de Villota was actually trying to come back to the paddock and she was piloting the Marussia F1 car at a low speed, too. At that point of time, as a matter of fact, she had completed a straight line aero test. Due to the unexpected acceleration, the Marussia F1 car rear ended one of Villota's team trucks. Ironically, the truck was actually the one which brought the Marussia F1 car onto the track in the first place. Unfortunately, the liftgate of the truck was partially lowered at that moment and Villota's head happened to strike it. Well, I bet you can guess what happened next. After the incident, Villota went into a coma lasting four days. Fortunately, the doctors managed to save her life but, well, the same couldn't be said of her right eye. 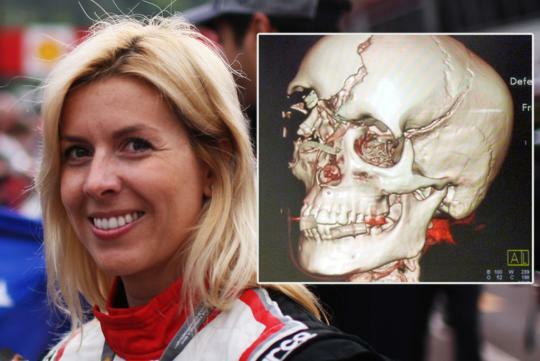 Yes, the horrifying and unfortunate crash cost Maria de Villota one of her priceless eyes. 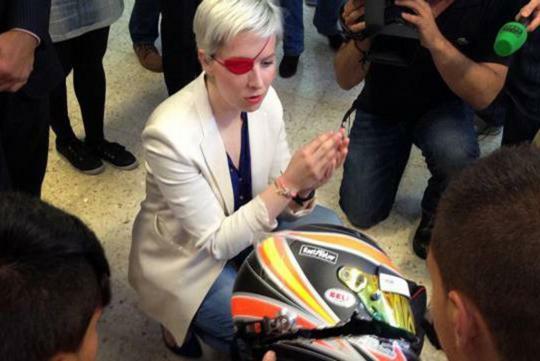 No longer an F1 test driver, Maria de Villota is now working as a road safety advocate in the country where she was born. Working as a road safety advocate, she never gets tired of showing her horribly damaged helmet to her audiences, hoping that more people - especially the more aggressive young drivers - will be more careful and always put on their helmets whenever necessary, for their own sake. For your information, I am confused whether she's stubborn or that she's persistent and just have a strong will. You know, after the horror she encountered, she has revealed that she still wants to get back into the F1 racing world, making an eventual comeback when the time comes.